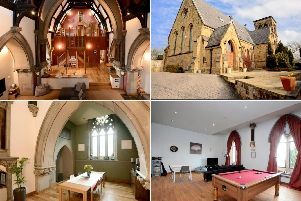 SKY HIGH: This beautiful apartment in Skipton is set over three floors in a converted mill tower. It has panoramic views over the canal, the market town and the countryside beyond. This apartment is set in a former mill tower in the centre of Skipton and comes with 360 degree views across the town that has been declared the best and happiest place to live in Britain. Estate agent Amanda May, manager of Dale Eddison’s Skipton office, says: “This is one of the most amazing properties in Skipton town centre. It is, in effect, a detached house in the sky and has stunning views over the canal and the town. The interiors are also beautifully presented. It really is a home in a million”. Converted by Novo Homes ten years ago, the tower is part of Glista Mill, a former cotton mill bounded by the canal and Broughton Road. It’s a five-minute walk to the town centre and a two-minute walk to the train station. Aireville Park and the leisure centre are also on the doorstep. The mill buildings are now 65 luxury apartments with underground parking and a canalside terrace for the sole use of residents. Novo described the tower apartment as the “jewel in the crown” of their conversion and Barbara Finnerty agreed. The retired teacher was among the first view the newly-converted tower and snapped it up immediately. “I fell in love with it. I liked the location and the fact I could walk everywhere but most of all I loved the views from the tower and the light that streams in from the floor-to-ceiling windows. Apartment 65 occupies the three floors in the tower and has a vestibule, entrance hall with cloaks cupboard and a walk-in storage area with freezer andi washer-dryer. Stairs lead to a sitting/dining area with full-length windows. The kitchen area has a breakfast bar. Stairs lead to a bathroom and a large split-level bedroom. There is a parking in the basement garage. The property is heated by Farho environmentally-friendly and energy-efficient radiators, which can be controlled remotely and the apartment has an integral multi-source audio and video system with ceiling speakers.